In the tradition of Arturo Perez-Reverte's Club Dumas and Umberto Eco's The Name of the Rose, Spanish author Carlos Ruiz Zafon has created a gothic masterpiece in The Shadow of the Wind. The dark beauty that Zafon elicits begins the the Cemetery of Lost Books, the ficitional last resting place of every published book known to man. In order that the magic of the written word may never be lost, no matter the current popularity of a tome, scholars and bibliophiles regularly rescue last copies of a text, burying it here, safe from the ravages of neglect or fascism. 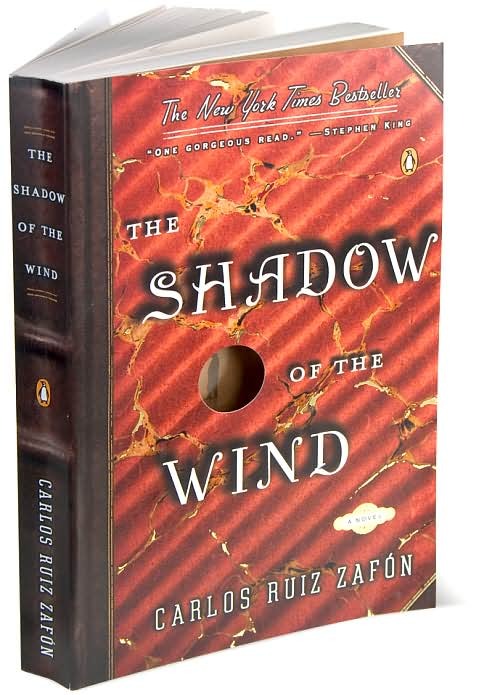 Ten year old Daniel Sempere discovers in the Cemetery of Forgotten Books an engrossing novel, The Shadow of the Wind, which distracts him from the pain he feels over the loss of his mother. The novel sets young Daniel on a sojourn to discover all he can about the book's author, Julian Carax. A native of Barcelona like Daniel, Carax is thought to have been killed in 1936, just as the revolution reached the Catalonian state. Daniel is confronted by a mysterious stranger, reeking of burnt paper, who wishes to purchase the Carax novel at an exorbidant price in order to destroy it. Soon after, Inspector Fumero, a monster working for the fascist police state, enters Daniel's life. The story takes a series of unexpected turns as Daniel learns more about Julian, the monster he had become and the horrors of human failings that had driven him. The Shadow of the Wind is a blend of stories, coming of age for Daniel and redemption for others. Zafon writes beautifully, describing Barcelona in such exquisite detail that readers hardly need a map to visit. A note on Lucia Graves' translation of the book: It is beautifully crafted, the work of a consummate professional.